Leslie Ann Howard, President & CEO of United Way of Dane County, announce the new HIRE Initiative with 50+ community partners. On August 14th, United Way of Dane County kicked off its 2014 Annual Campaign at Madison Mallards Stadium at its annual luncheon sponsored by Oscar Mayer, announcing a commitment to raise $19 million to benefit the Dane County community and launch a new multi-faceted initiative, the HIRE initiative focused on reducing poverty in Dane County. United Way with its partners will launch HIRE with a total of $1 million dollars to kick-off the 2014 Campaign. With an initial investment of $550,000 from American Family Insurance and additional gifts from the Jack and Sarah Salzwedel family, Steve Stricker American Family Insurance Foundation, UW Health, Diane Ballweg and Endres Manufacturing Company Foundation, Dianne Christensen, Alliant Energy, J.H. Findorff & Son Inc., MG&E, and Anna and Andy Burish. “Dane County is an incredible place to live. I’ve learned over the years, when we ask individuals in our community to get involved, they do. That’s what we’re doing again this year,” said Jack Salzwedel, American Family chairman and chief executive officer, and chair of this year’s Dane County United Way campaign. She was also joined in announcing the HIRE initiative with United Way Board Member Darrell Bazzell, Chair of United Way’s Vision Council and Vice Chancellor of Finance & Administration for University of Wisconsin-Madison and Dave Beck-Engel, President of J.H. Findorff & Sons Inc.
Bazzell also emphasized that the HIRE Initiative is expanding supports around participating families in three fundamental areas: early childhood education, housing and employment. HIRE will do just that. Creating a combined approach with supports on every side of the family reinforced with local service partners in the private, nonprofit and public sector United Way estimates in the first three years of this work, 240 individuals will secure or improve their employment and 45 families get a safe and stable home. “Imagine being able to help someone get on the path out of povertyfor about $3,500 per household.” said Bazzell. This year’s campaign is focused on ending family homelessness and reducing poverty in our community through targeted strategies in the areas of Education, Safety and Health. 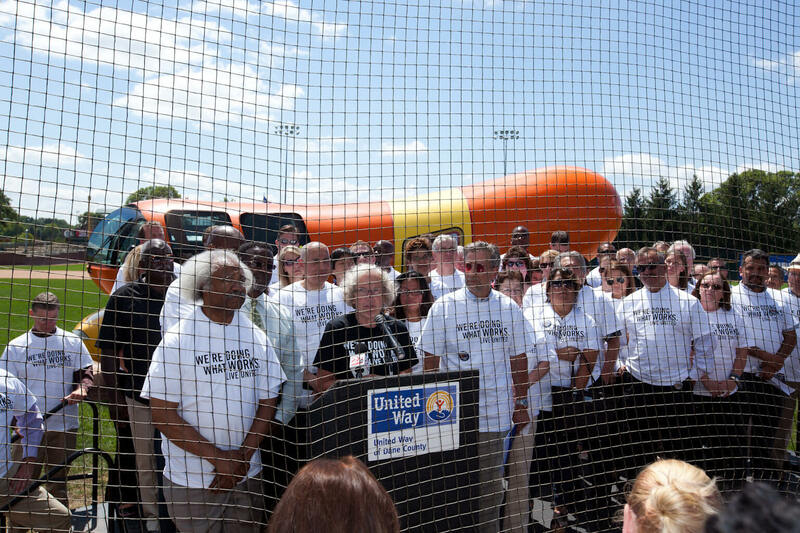 Sponsored by Oscar Mayer for the 21st consecutive year, today’s kick-off event marked the beginning of not only the campaign but also Dane County’s largest volunteer event – Days of Caring – which will mobilize over 3,600 volunteers in the few weeks. Days of Caring volunteers will make progress on all three priority areas of our community’s Agenda for Change goals, with a special emphasis on decreasing family homelessness, which is a key element in leading families and individuals onto pathways out of poverty. At the kick-off luncheon, United Way collected items for families moving into stable housing. These will be distributed through United Way partner agencies who work directly with Housing First families. Items collected include: dish soap, toilet brushes, sponges, toilet bowl cleaner, scrub brushes, and all-purpose cleaner. United Way is still accepting donations for these kits. If you are interested in donating items, contact Jay Young at 246-5497 or jyoung@uwdc.org. Give through your workplace campaign, start a workplace campaign at your organization or business, visit www.unitedwaydanecounty.org, call (608) 246-4350, or send contributions to United Way of Dane County, PO Box 7548, Madison WI, 53707-7548. We invite every member of the Dane County community to participate! Visit www.unitedwaydanecounty.org and click on “Volunteer Now”, or log onto www.volunteeryourtime.org or call United Way 2-1-1 by dialing 2-1-1 or 246-4357. Advocate for change by participating in a community discussion. 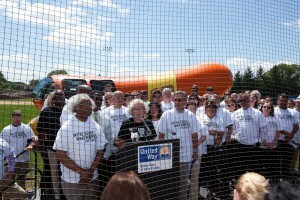 Visit unitedwaydanecounty.org to see a list of upcoming events.